James specialises in Personal Injury, Industrial Disease and Clinical Negligence. He regularly represents both Claimants and Defendants. 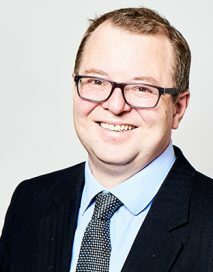 James has been head of the personal injury team at Dere Street Barristers in York and Newcastle, since 2017. He has presented cases at all levels up to the Court of Appeal during continuous practice at the Bar since 1992. This experience includes such varied matters as Multi-track trials involving catastrophic life changing injuries, head injuries, and the complications of what start off as one thing and become much more serious such as total loss of speech after damage to teeth and chronic pain arising from complex regional pain syndrome and conversion disorders and fibromyalgia. He also deals with Road Traffic Cases involving Fraud, Employers’ Liability and Public Liability. He is very familiar with cases involving Local Authorities and the Police. Also, civil and criminal jury trials and Inquests. James undertakes Inquest work especially associated with fatalities at work, industrial disease, police conduct and medical malpractice. He has over 20 years’ experience of industrial disease work especially deafness/ HAVS claims and has a particular interest in asbestos related cancer and mesothelioma claims. Clinical Negligence cases have become more important as his career has progressed and this has brought additional experience of dealing with physical injuries occurring in conjunction with post-traumatic stress and depression. He gets on well with clients and is very approachable. James is used to working with and getting the best from medical and other experts who are often located in different cities across the country to ensure they are used to best effect and are the right person to present the evidence to the other side and the Judge. He good at dealing with the practical and legal issues surrounding head injuries, life changing events such as depression, chronic pain, amputation and fatal accident cases requiring a sensitive and intelligent approach to litigation. The use of pain Management Consultants and innovative consideration of up to date therapies, aids and equipment and prosthetics using the latest and most up to date Occupational Therapists is a separate skill developed over 20 years of experience. James has represented his clients at Joint Settlement Meetings (JSM) and in formal mediation achieving good outcomes by applying practical sense and using his experience of courts. Merseyside Police. (2017) Deafness: successful defence of Claim arising from exposure to police sirens. Re A (2017) Inquest into underground mining fatality at Boulby. W v A (2018) injury arising from police Inspector attempting to arrest suspect and dragged behind suspect’s vehicle. Issues re loss of pension and enforced early retirement. Acceleration of preexisting condition leading to issues re causation around early retirement. S v Ministry of Justice Claim (2017) by prison officer for loss of career due to permanent ankle pain and pension loss. Successful use of forensic accounting. Won at trial on liability followed by settlement of quantum outside the court. T V F. Head injury after fall from garage forecourt: use of buddy to regain independence, adaptations Future loss of earnings Disability Depression post traumatic headache, epilepsy. Residual earning capacity. C v Cleveland Constabulary (2018) amputation of leg below knee after unlawful arrest and false imprisonment. Use of excessive force during restraint in custody. Psychological injury and therapy (EMDR/ CBT) Prosthetics for work and sport as well as everyday use. specialist wheelchair. Loss of earning capacity. D v S Trust (2018): Psychiatric loss of voice after injury to teeth Successful defence of big money claim. Successful use of covert surveillance. Settled at JSM. Re C Fatal accident: dependency claims for mother and infant child. Relocation of family; loss of career opportunities. Apportionment of damages between mother and daughter. Successfully resolved at JSM without need for trial. Furniss v. Firth Brown (2008) EWCA 182: Court of Appeal: Limitation Act / competing sources of Deafness. S V. Bradford Teaching Hospitals NHS Trust (2005): Clinical Negligence. Birth Related Brain Damage / Cerebral Palsy. Causation Issues. Court of Protection. Personal Injury Trust. £4 Million Full Value. S v. Cripps: Serious head injury following RTA: Personality changes / loss of employment capacity. Suicide risk/ impetuosity. Capacity to conduct own affairs. Court of Protection. F V. Calderdale Health Authority: Leeds QBD; Clinical Negligence. Brain Injury; Difficult Issues of Causation; Liability Split 75/25; £1.3 Million Full Liability. T v. Wasteaway Skip Hire & Others EAT May (2008): Scandalous Conduct by solicitor representing her husband /appropriate sanctions/ strike out. Tomblin v. West Coast Trains Limited EAT Nov (2008): Findings of Fact/Perversity. Drewitt v. Seafield Logistics (2006) ICR 1413: EAT: future loss assessed on the basis of a percentage because the Claimant had underlying illness. 1992 Call to the bar by The Honourable Society of the Middle Temple. After call to the Bar in 1992 he had the benefit of a pupillage with Michael O’Neill an acknowledged personal injury expert. He is a member of the North Eastern Circuit and was Circuit Junior 2008/9.